This is the most commonly performed investigation for assessing injured limbs or examining the chest for possible infection. An x-ray image, or radiograph, is produced when a very small amount of radiation passes through the body and strikes a sheet of sensitive film or a detector placed on the other side of the body. 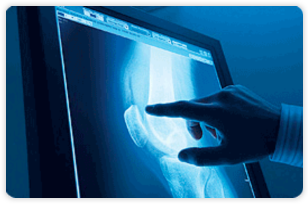 The ability of x-rays to penetrate tissues and bones varies according to the composition and mass of what is being imaged. Bone, which contains calcium, absorbs most of the radiation and results in white images on the x-ray film. The lungs, which are filled with air, allow nearly all x-rays to pass through and strike the film or detector resulting in a black image. You will not feel any discomfort during the procedure.